Christmas in Zermatt is a magical experience – Matterhorn Chalets give their top seven reasons why! Zermatt’s bars ooze style. Stop off in one of the piste-side mountain restaurants, or the many bars in town and enjoy excellent company, great views and a stylish environment. Alphitta is a must for lunch, the view from the terrace is unbeatable, the staff are friendly, and the food superb. Extensive skiing at over 3000m-the Klein Matterhorn glacier is open year-round and the upper pistes are the highest in Europe at over 3800m. The village is at 1620m and the resort has a great snow record. Since it was consecrated in 1870, St Peter’s Church seats over 800 people for their Christmas service. Built during the ‘Golden Age’ of Alpinism and part-funded by the families of those who died during the fateful first ascent of the Matterhorn, a visit is an essential part of any trip to Zermatt. Preparing Christmas dinner with all the trimmings can be a stressful undertaking – one of the best parts of going away for Christmas with Matterhorn Chalets is that everything is done for you! All you need to do is go out for the day, enjoy skiing and come back to the chalet in the evening for a hot bath followed by apéritifs, and then Christmas dinner. One of the highlights of Zermatt is its car free village. Normal vehicles are banned and transfers from the railway station and around the resort are made either by electric taxi or the ultra-efficient electro-bus. 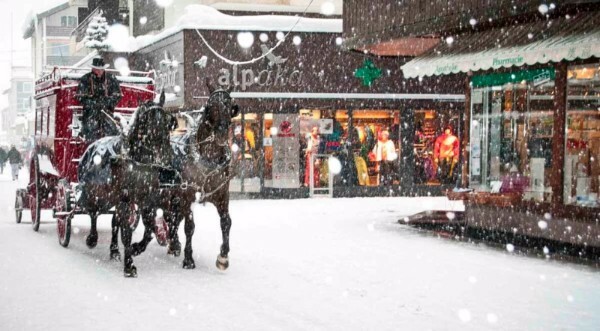 With sledging and snowy playgrounds, Zermatt is a wonderful place for children to spend Christmas.The roads are not cleared so everything is white and with the colourful decorations around the village, it looks like a genuine winter wonderland. As a holiday destination, Zermatt prides itself on its child friendly facilities and all the local restaurants are pleased to cater for younger patrons while the resort has a host of non-skiing activities. A Christmas present – FREE lift pass for under 20 year olds! Matterhorn Chalets offer a FREE week’s lift pass to all children and teenage guests in Chalet Ulysse. Chalet Ulysse is available from 20-27 December from £17,950 (£1495pp -sleeps 12/option for 8) including UIAGM mountain guide/instructor; 6 nights fine dining/early kids tea as required plus all beverages – soft drinks/ quality wine. Matterhorn Chalets offer a NEW Spring Ski Touring Week in Zermatt, Switzerland, from 9th to 16th April 2016. 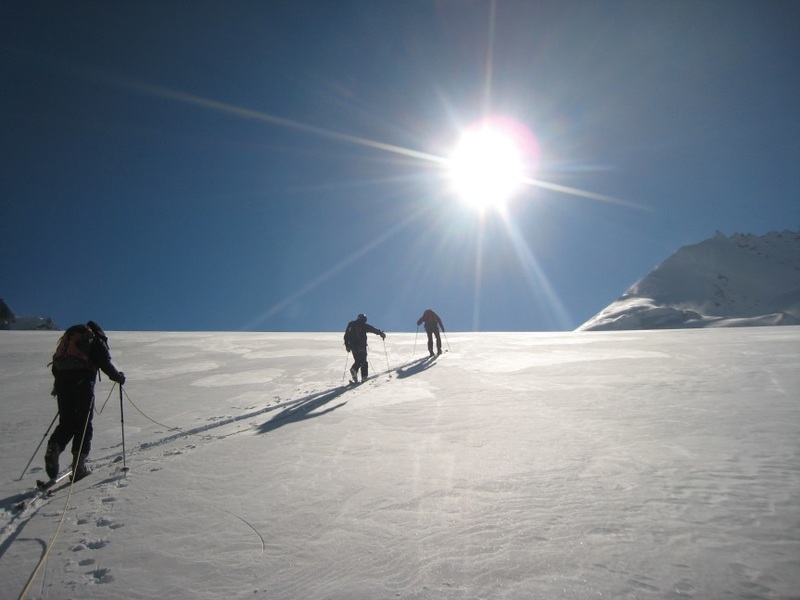 Zermatt is famous in the world of ski touring for being the end of the ‘Haute Route’ – the iconic ski touring itinerary – and also the start of the gruelling ‘Patrouille des Glaciers‘, an overnight race on skis to Verbier. Matterhorn Chalet’s NEW Spring Ski Touring Week will provide the opportunity to experience a series of day tours from Zermatt and in to its surrounding valleys. With a maximum of eight places, the group will be based at Chalet Ulysse, and will be led by a fully qualified (UIAGM) and experienced local mountain guide. Day one will be an introductory day tour, to warm up and test kit, starting from Trockner Steg, and ending up at Testa Grigia for lunch at a refuge on the Italian-Swiss border. The remaining days of touring and off piste skiing will depend on snow and weather conditions at the time but will include five days touring and off-piste skiing with Matterhorn Chalet’s guide. The price of £1490 per person includes 7 nights serviced accommodation in a shared twin room in Chalet Ulysse, with daily breakfast and a four course dinner with wine on six evenings. Also included are all guide fees and local taxes. Notes: Participants need some experience of touring with skins, and should be reasonably confident off-piste skiers. If required, specialist equipment can be rented in Zermatt.